Congress Has The Ability To Fix Immigration Crisis, Obama Says : The Two-Way His remarks in Dallas followed a meeting with faith leaders and local officials, including Gov. Rick Perry, to discuss the large number of unaccompanied minors at the border. President Obama and Texas Gov. Rick Perry meet in Dallas on Wednesday. They later attended a meeting about the border and immigration together. President Obama said Wednesday that Congress has the ability to address the problem of thousands of unaccompanied children and teenagers illegally crossing the border from Mexico into the U.S.
"Right now, Congress has the capacity to work with us, work with state officials, local officials and faith-based groups and non-for-profits who are helping to care for these kids," he said in Dallas. Obama added that it is unlikely the minors will be allowed to stay in the U.S.
"We intend to do the right thing by these children," he said. "Their parents need to know that this is an incredibly dangerous situation, and it is unlikely that their children will be able to stay." Obama's remarks followed a meeting in Dallas with faith leaders and local officials, including Texas Gov. Rick Perry, to discuss the situation at the border. 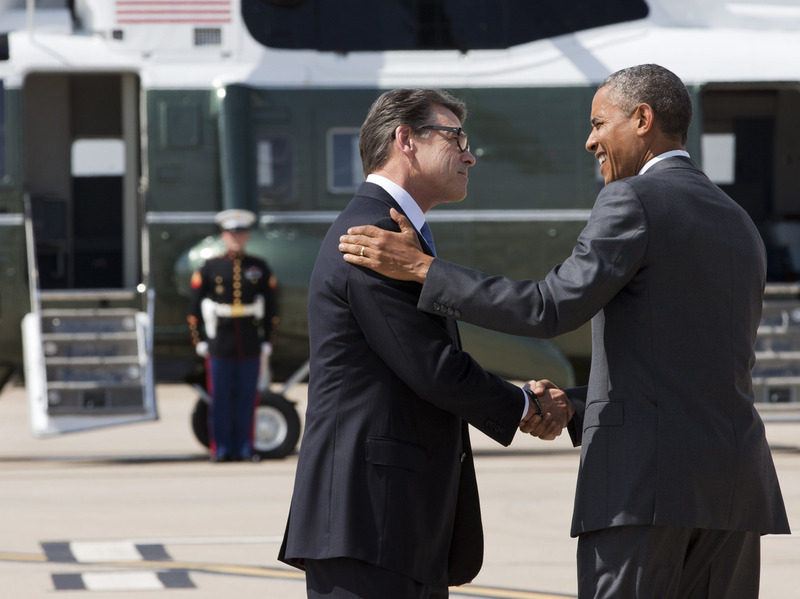 "Obama says Perry raised four areas of concern and made suggestions. Obama says he doesn't have a philosophical objection to anything Perry suggested. He says if Congress passes his emergency funding request, the government will have ... resources to take some of the steps Perry recommended. Obama says the problem is fixable if lawmakers are interested in solving it. He says if the preference is for politics, it won't be solved." On Tuesday, the White House asked Congress for $3.7 billion to address the humanitarian crisis. "The statement said the funds would cover domestic enforcement, repatriation and reintegration of migrants, transportation costs, additional immigration judges, prosecutors and litigation attorneys to 'ensure cases are processed fairly and as quickly as possible.' "
The money also would pay for the care of the children and teenagers who are in the country illegally. If you're wondering what's causing the latest crisis at the border, NPR's Alan Greenblatt has an explainer; and NPR's Frank James reports on the politics of Obama's visit to Texas.